Spinning on the Great Walking Wheel. This Civil War Era treasure is complete, original and operational! 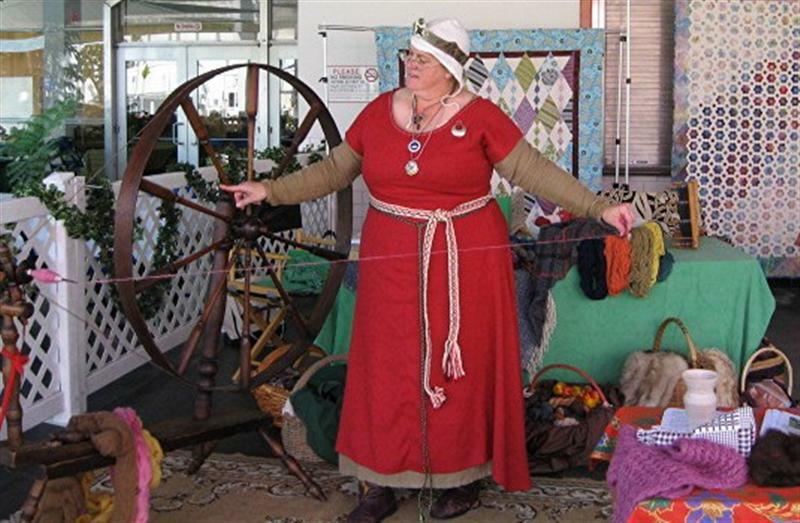 Students really understand the Sleeping Beauty Story when they see this wheel spinning! 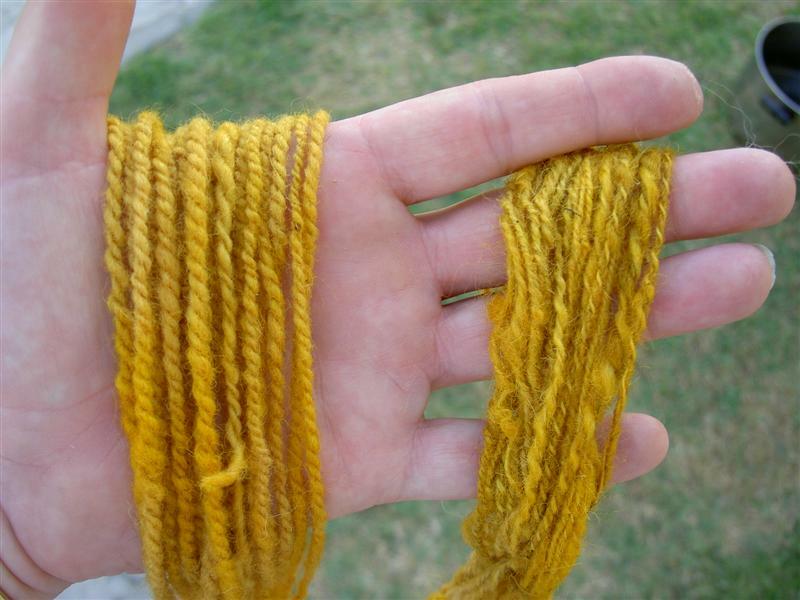 Bridget has been experimenting with the local (Southern Calif) dyestuff, Dodder. This plant-parasite was harvested off the wild bushes along the 210 freeway in May 2008. 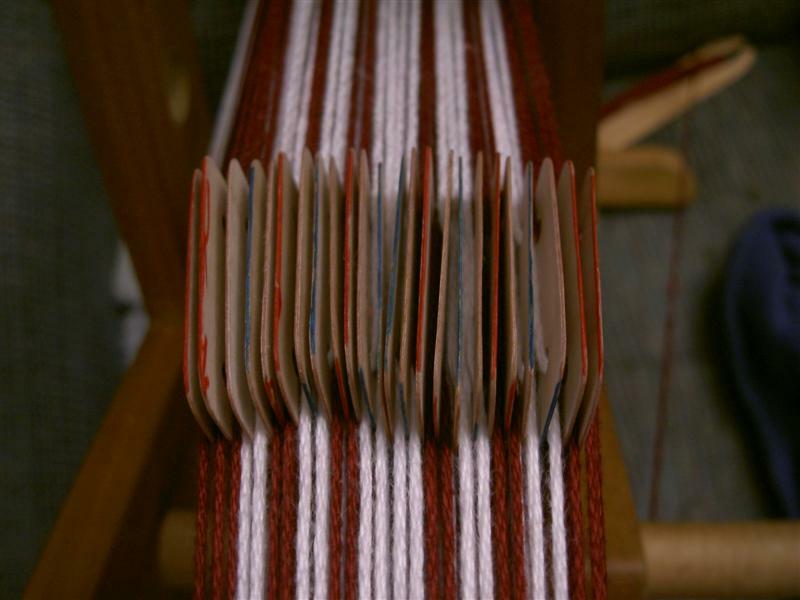 Bridget pre-mordanted her handspun wool with Tin and Cream of Tartare, and set in into the simmering Dotter. Got this fabulous Golden Orange color! 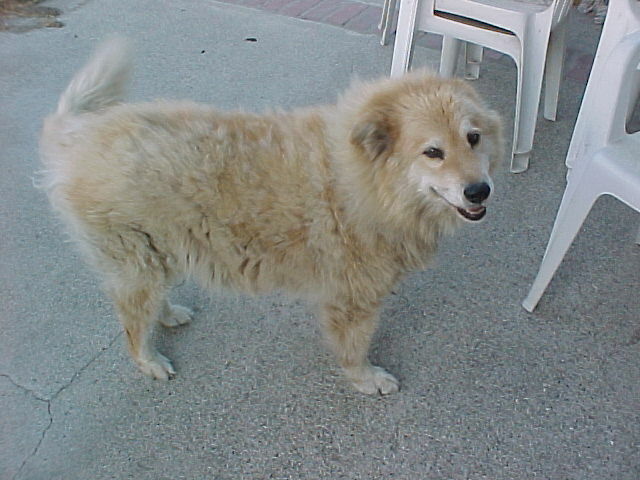 This Dog Hair Tam-o-shanter won second place in 2003 Pentathlon. Bridget spun the dog wool and knitted it into this tam. 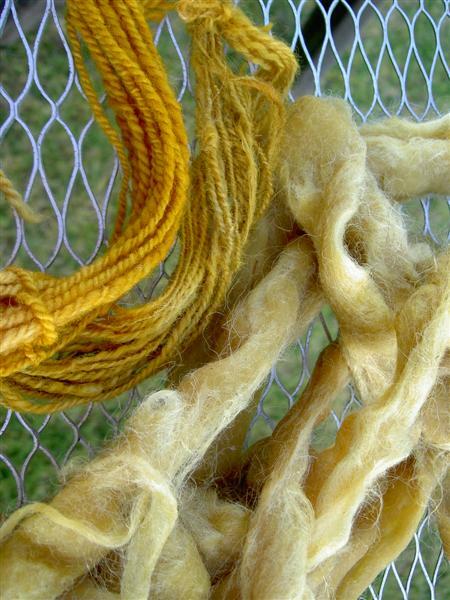 Shown is Goldie the Dog who donated her wooly fur. 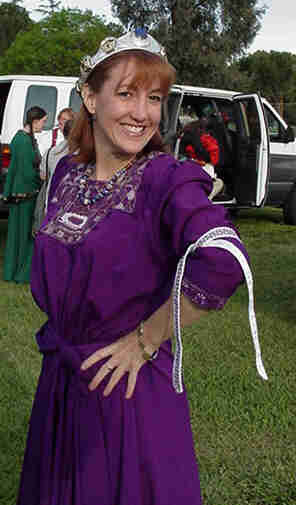 Competed in Pentathlon 2005 with handspinning and weaving entries. 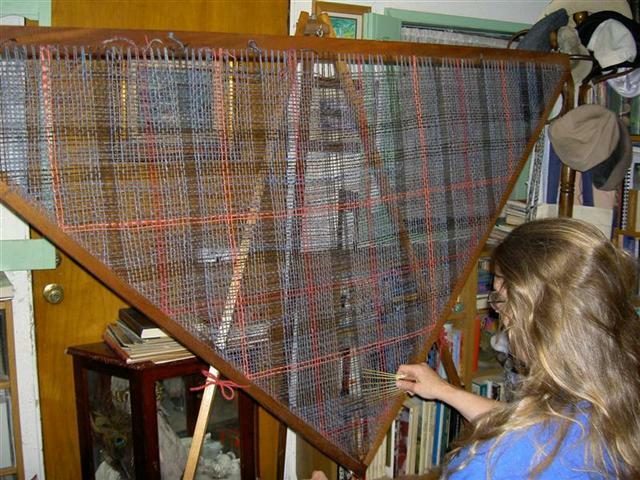 The photo below shows weaving handspun wool into a shawl on a triangle loom. 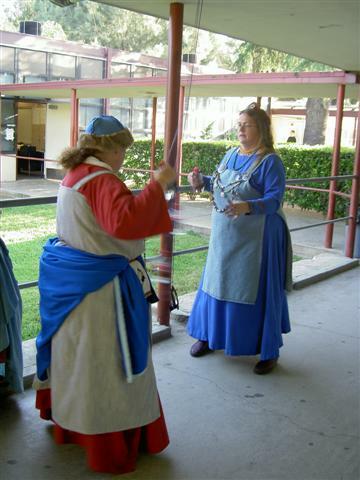 Taught classes at most Collegiums, Wars and other events in Spinning, Weaving (Card and Inkle), Viking Whipcord Braid, and Embroidery. 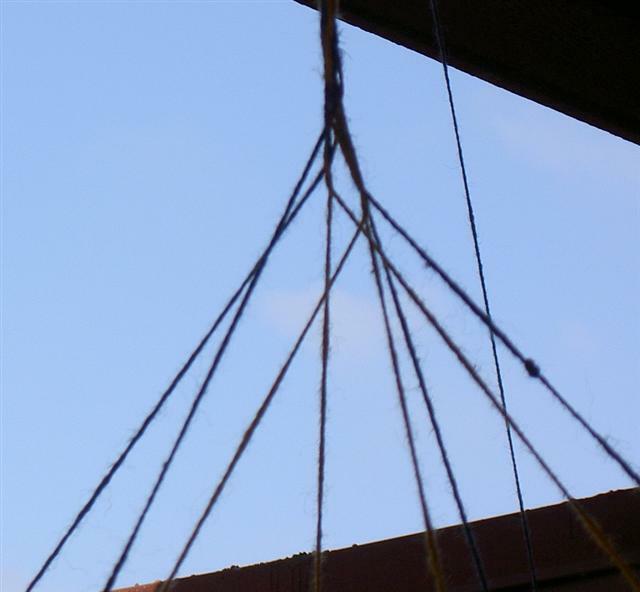 Here is the handout on Viking Whipcord Braid, use it freely, but give Bridget credit for it! Caidan Cross stitch designed by Bridget. 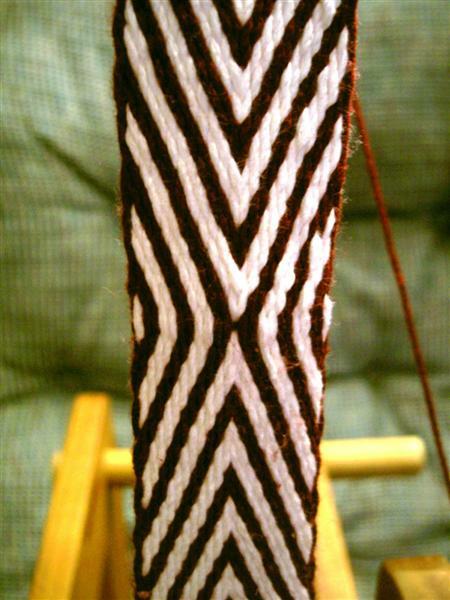 Left is White Scarf made with Caidan Cross stitch, right is the stitch half-done. Here is the Excel spreadsheet showing how to do the pattern. Use it freely, but give Bridget credit for it! This is a Blackwork White Scarf made by Bridget for Battista del Lagos at her Festival of the Rose. 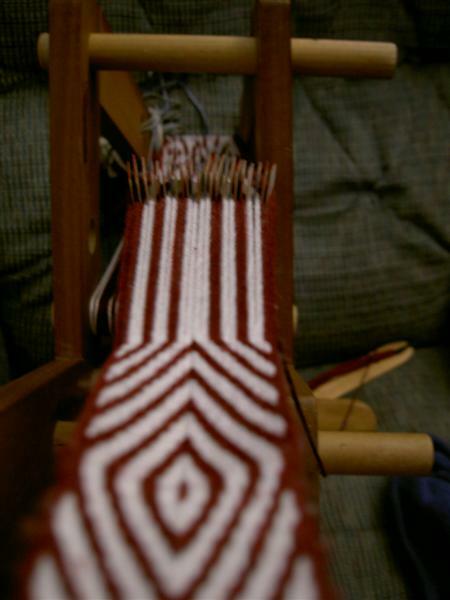 Bridget felt the colored blackwork pattern looked like little yellow flowers and is in Batista's personal colors. With this favor, Bridget won first place in the Arts Competition, earning a beautiful Oso knife!